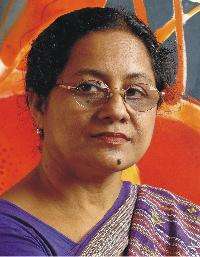 FARIDA ZAMAN, Born in 1953 at Chandpur, Bangladesh. She is Chairman and Professor at Department of Drawing and Painting Faculty of Fine Arts, University of Dhaka. Her works movingly articulate the lives of fishermen and women. Farida Zaman’s line d rawings represent one of her main artistic traits. The lines, dots and various familiar forms are inspired by Bangladeshi folk elements.